To customize your Nanacast login page, first Login to Nanacast. Click Manage > Memberships, then click the Edit Listing link of your offer. Scroll down and expand the Membership Login page Settings. 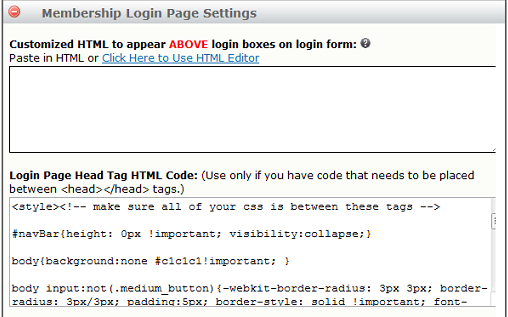 Add your CSS within the Login Page Head Tag HTML Code box. Make sure to use <style> tags or your CSS won't work. Below are some examples of tags that can be used to manipulate the login page: **HINT** The !important; CSS modifier is useful for overriding existing inline CSS.